In March, Dom from Portals to th e Past, visited Year 5. 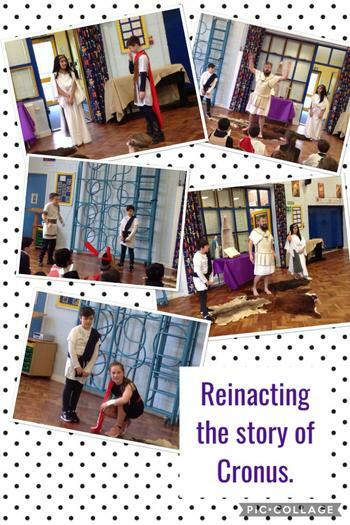 We took part in many different activities to help us understand about the Ancient Greeks. To begin, we reenacted the story of Cronus. This gave the children a good understanding of the relationships between the Titans and the Olympians. 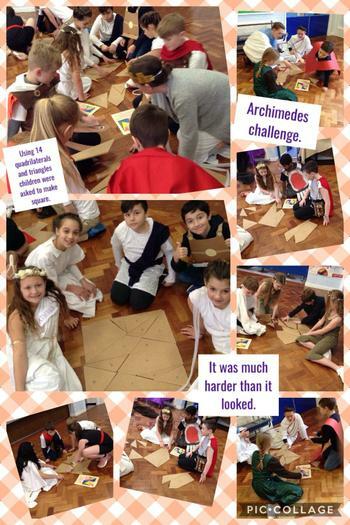 Next, children worked as part of a team to completed a Greek puzzle. The puzzle consisted of quadrilaterals and triangles that fit together to make a square. The puzzle was invented by Archimedes, a Greek mathematician. It looked a lot easier than it actually was. After lunch, we played a game of crushing. 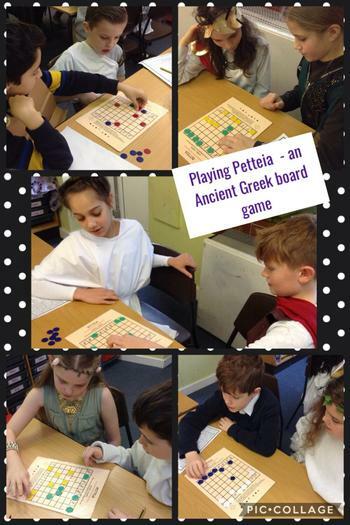 A Greek game using counters and a square board. The aim of the game was to 'crush' your opponent by blocking them in between two of your pieces.